Princess Mononoke is another great Miyazaki file recently out on DVD, and while it's not one of my favorites it's still a good film with some excellent animation. The story is about a young man named Ashitaka who saves his village from a rampaging demon but in the process becomes infected with a deadly curse. The villagers must then shun him and he heads off to find a cure. This curse, though it will eventually consume Ashitaka, does have a good side in that it gives him super-human strength and power. He discovers this when he shoots an arrow which completely removes its target's head. So in his journey to find the spirit that can cure him he encounters a village run by Lady Eboshi, who is destroying the surrounding forest to mine the iron ore underneath. And turns out this is what's causing all the spiritual trouble. The character of Princess Mononoke only really comes into the film after Ashitaka encounters this village, and she turns out to be a feral young lady who was raised by wolves. Ashitaka attempts to prevent Mononoke from murdering Lady Eboshi, but then also prevents lady Eboshi from ending Mononoke. So Ashitaka is supposed to represent the balance between nature and technology or industrialism. Usually I watch anime with the original Japanese dialog, but this time I watched it with the dubbed English dialog and it was well done. The voices all felt like they matched their characters and was all totally believable. The original Japanese language track is included, though, so if you prefer that then there's no need to worry. Both tracks are 5.1. 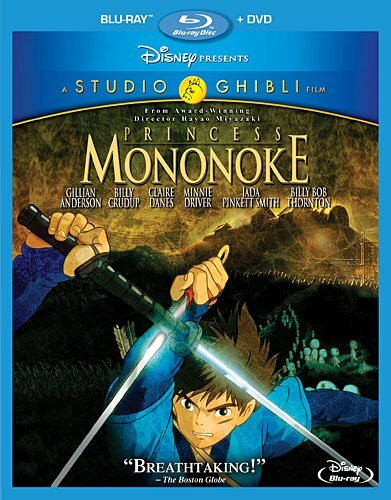 There are a few decent extras included, like a featurette on the English cast, a storyboard reel with Miyazaki original drawings, and a featurette about Miyazaki promoting the film in the U.S back in 1999. There are lots of trailers too, if you like watching those. I usually pass. This is a good film, but with a heavy-handed message and not much comedy to lighten the mood. That's probably why it's not one of my favorites. It's very serious and is enjoyable, but not something I'd like to watch over and over.